Featured on the EXTREME MAKEOVER: HOME EDITION. 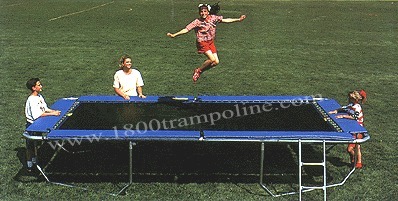 To purchase the trampoline and enclosure combo, click here. Welded Loops on inside of pipe for EASY spring attachment! 6'x12' Jumping Surface Mat (Non-abrasive Permatron Poly Propylene with 775lbs/sq.in. bursting strength at the edge. Blue sunscreen protector extends the life of the stitching on the mat edge/seam. Pads are made of Heavy Duty, Weather Resistant Vinyl. Due to the fluctuation of fuel charges, the shipping price may increase depending on your location. If so, we will call you with an adjusted price.